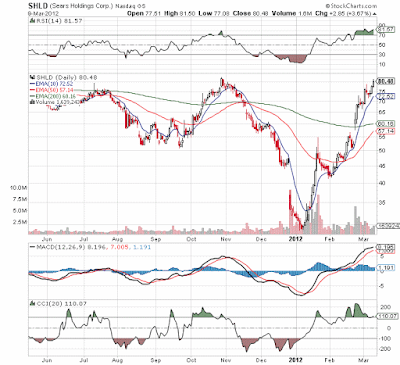 Never a dull moment with the Sears Holdings (SHLD) stock. As mentioned in several previous posts, Sears has finally begun the process of externalizing brands [See article: Externalizing Brands Could Be Major Catalyst For Stock] and monetizing assets. Today came news on both fronts. First, reports began flying around that Sears has placed Lands End up for sale at a price tag of nearly $2B. 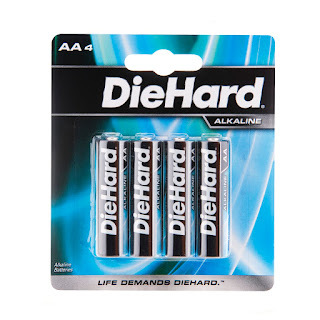 Second, it announced that DieHard has finally released an alkaline version of its very popular automotive battery. Of course, the market is spinning this potential sale as a desperate move for cash which couldn't be farther from the truth. In fact, shorts should be very concerned if Sears can reach any price close to $2B. Part of that cash could be use annihilate any remaining float making it impossible to cover any remaining shorts [See article: Impossible To Cover]. As the US shale boom produces a bounty of dry gas and now even oil, the promises of a shale gas revolution in Europe and China is fading quickly. It may still happen, but it might take a decade to develop different techniques as the methods that worked in the US clearly aren't going to work in places such as Poland where population density and harder rocks make it a more complex and costly endeavor. The shale boom had great promise in helping Poland and the rest of Europe lessen dependence on expensive Russian supplies. Instead, the Polish Geological Institute recently cut the estimated gas reserves by 85 percent. Now before even starting, major US corporations like Exxon Mobil (XOM), Chevron Corp (CVX) and ConocoPhillips (COP) are faced with doubts about whether the drilling will ever be feasible even if the gas does exist. This is a far cry from the scenario in the US where the technologies have already proven. This stock was crushed today, down over 5% at the close. 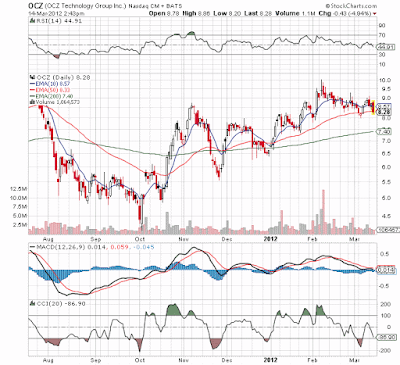 On top of that Carrizo Oil & Gas (CRZO) is down over 33% from last years high. The main issue is that the market still sees it as a natural gas play, but clearly the company has already moved to mainly oil. Per the interview below on Mad Money, the CEO reconfirms that the company is already 60% oil and will hit 80% oil by the end of the year. The most interesting part of the interview was the prediction that 2013 revenues could hit $750M with the current rig count. Incredible considering analysts forecast something in the $600M range and considering the company just sold a large chunk of Barnett Shale production. Also worth noting is that the company will be throwing off cash in 2013 though the CEO wants to add rigs once the company reaches that level. All in all very positive news about a stock I was becoming concerned about. According to this Reuters report on CNBC, iron ore demand is set to grow at 11% through 2017. Wait, didn't stocks initially plunge today due to fears of slower demand in China for iron ore? Talk about a confusing market with conflicting currents in the news. The actual news from BHP Billiton (BHP) today was that demand from China was "flattening" or otherwise growing in the mid single digits versus the double digit growth of the past decade. Slower growth, but still growth. How this is news was beyond me. Everybody should know by now that China wants slower growth. Stocks like Alpha Natural Resources (ANR) are down some 75% since early 2011 peaks. The market has already harshly punished this met coal producer to the extreme making the initial 6% drop further signs of a bottom. Remember that met coal is used with iron ore to produce steel. A few days back, an interesting debate took place over whether investing in Coca-Cola (KO) or gold was a better long-term investment. Jim Grant made the point that gold had been the better investment since 1996, against an argument by Warren Buffett. Grant suggested that Coca-Cola was now the better option. That comment just about shocked me as he pointed out that it has a current PE of 19. Slow growing Coca-Cola with a $160B market cap is a value? Today's news on the closing of the secondary and the exercise of over-allotments shouldn't be that big of a deal, but the stock is down 5.5% now. Hard to tell the reason for the selloff other than maybe the over-allotment was partially exercised. This is possibly seen as a negative in the market though I don't see this move as surprising. The secondary was for $9 and the stock is selling below those levels. Why take that deal when the open market is cheaper? OCZ Tech (OCZ) remains a leading provider of high-performance solid state drives (SSDs) for computing devices and systems that remains in very high demand. The company will presumably use these funds to land a very large customer though the company has yet to verify or deny. That might also be the cause of the selloff. Traders might be fleeing the stock considering the secondary has been closed and the speculated major deal has not been announced. Navistar (NAV) makes commercial trucks, buses, step-vans, diesel engines and chassis for motor homes. Otherwise, the company focuses on the large motor vehicle sector. 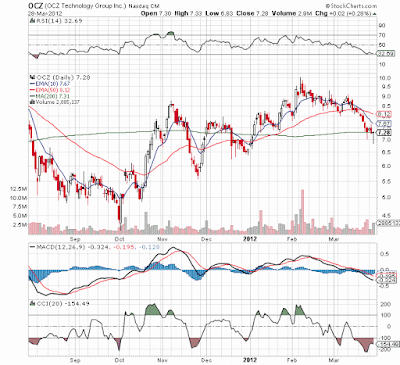 This stock provides one of the most compelling valuations in the market today, if the company can hit financial goals. That remains a big 'IF' for this company considering the recent disaster of a Q1'12 reported just last week. Hence the question on whether the stock is cheap enough to buy considering the constant inability to hit targets. The last 4 quarters have seen 3 profits misses all by at least $.15. These misses have caused 2013 earnings estimates to plunge from $8.13 only 90 days ago to $6.52 now. The most pessimistic analyst is already down at $5 showing a growing distrust with the ability to hit targets. This model gained a solid 4.9% in February versus 4.1% for the benchmark S&P 500. As typical of this conservative model it tends to gain alongside the market on the way up and outperform during periods of weakness. Trades February was a slightly more active month for this model with 4 trades mainly switching out of two positions with reduced yields for two positions with attractive yields. Gilead Sciences (GILD) and Banco Itau (ITUB) were both sold during the month. Gilead Sciences is a leading biotech firm that greatly reduced their stock buyback program in order in purchase Pharmasset. This virtually eliminated the net payout yield as the company confirmed on the Q4’11 earnings call leading us to selling the stock as it surged on earnings. See blog post for more details. Anybody following the general market and especially this blog already knows about the CEO placing this company up for sale. See previous article on this blog with a link to an article I wrote for Seeking Alpha for more details. 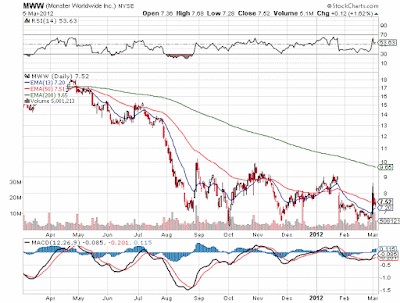 Today the stock for Monster Worldwide (MWW) is up another 4% mainly with the general market. Possibly though the technicians are jumping on board as the stock has finally broken a couple of downtrends the last few days. For numerous valuation reasons, it's very logical for the stock to continue pressing above $10 prior to any deal announcements. The biggest risk to price is the next earnings report in April when the attractive balance sheet and brand meets the weak earnings situation. Until then, I'd expect the stock to remain in an uptrend. The biggest question could possibly be whether to cash out if the stock hits in the $12-13 range prior to a deal or wait it out for a possible $15+ as a few analysts suggest might be possible in a deal. Nothing like taking a financially strong sector combined with fears of cutbacks to provide for some exciting yields. With major government budget cutbacks expected in the US, the defense sector went through a few rough quarters in 2011. Investors feared the worse. At the end of the day though, the companies remain strong and according to a Bloomberg report, most of the top dividend yielding stocks in the Capital Goods sector belong to the defense sector. Disclosure: Long LMT and RTN. Please read the disclaimer page for more details. A day after Oppenheimer questioned whether Monster Worldwide (MWW) was serious about selling the business, news leaked after the close that it had indeed hired investment bankers. Clearly this doesn't mean a deal will be done, but it shows the intent does exist. To step back a little, Monster's CEO had made an announcement at a conference earlier last week suggesting the company was looking for strategic alternatives to boost the stock price. The stock sprang up nearly 20% that day, but quickly settled back down as reality set in helped by Oppenheimer. Trading should be interesting tomorrow and the rest of the week. The stock remains very cheap and any real intent to sell the company could likely fetch numbers back towards the July level of $13-15. Great picture comparing the price of the 3 main energy options: coal, nat gas, and oil. Not only does this chart show current prices, but also the futures for each item. It is worth noting the higher prices of natural gas in the future. The price increases substantially over current prices. Unless coal sees a similar rise in the future, all the power stations converting to nat gas will cause higher utility prices down the road. Especially in case where coal plants are being closed. Maybe great for the environment, but I seriously doubt consumers will agree when they get bills during a brutally cold 2013 winter. Just guessing.